1. Ancona: the capital of Le Marche is a harbour city split into two parts. On Monte Guasco you can visit the historical centre and on the coast the recent area. Walk up to Corso Mazzini, where you will find the Calamo Fountain. If you drink a bit of water from each of its 13 streams, your wish will come true. The rose and white marble facades of the Cathedral of San Ciriaco are enchanting. Another recommendation would be to try the Verdicchio dei Castelli di Jesi, an exceptional white wine from the Ancona province. 2. Cingoli: this hilltop town has been nicknamed the "Balcony of Le Marche" because of the stunning views it offers, especially from behind the church of San Francesco. Cingoli was briefly famous in 1829, when Pius VIII, born in this town, became Pope. 3. Urbino: in the 15th century, artists and scholars from Italy and many other countries made their way to the pretty town of Urbino. They turned the city into a place of art, which went on to impact culture in the whole of Europe. Urbino is also the birthplace of Renaissance painter Raphael and architect Bramante. 4. 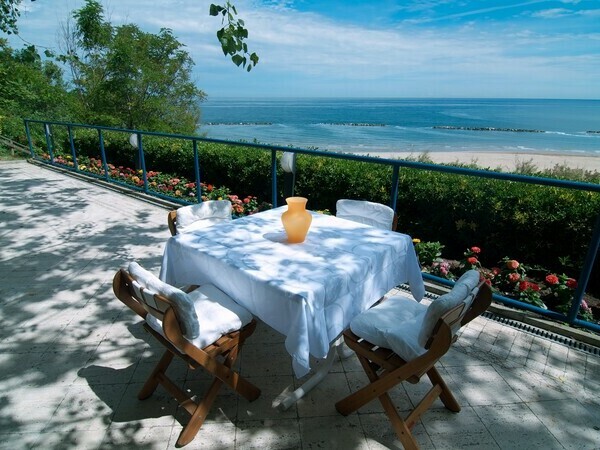 Pesaro: overlooked by the restored Palazzo Ducale, Pesaro offers wonderful beaches. Rossini was born here in 1792 and the town hosts every August an Opera Festival in honour of the famous composer. 5. Treia: the town was allegedly founded by the Sabines in Roman times and offers a mixture of Renaissance and neo-classical architecture. Treia is known for its Disfida del Bracciale, an annual ball game already played during the Renaissance. To enjoy a truly magnificent panorama, head to the Piazza della Repubblica. 6. Tolentino: this beautiful town is a place of pilgrimage due to the presence of the shrine of Saint Nicholas of Tolentino. Some amazing 14th century frescoes can be admired in the gothic Cappellone di San Nicola. When you reach the Piazza della Liberta, see if you can figure out the mystery of the numerous faces present on the medieval clock tower. Also to be noted is Tolentino's International Museum of Caricature and Humour in Art and its yearly corresponding festival. 7. San Severino Marche: the town was once Settempeda, a Roman colony with strategic positioning along the Via Flaminia. Great masters have emerged from San Severino Marche's school of painting and some of their work can be viewed in the Pinacoteca Civica. The elliptical shape of the beautiful Piazza del Popolo makes it a curiosity and the Feronia Theatre is named after a goddess worshiped in a city temple in Roman times. 8. A few more facts: black and white truffles can be found aplenty in Le Marche. Dante wrote a poem about the Gradara Castle and the tragic fate of lovers Paolo and Francesca in his Divine Comedy. If you fancy a day of shopping, there are many designer outlets, such as Prada, to choose from. Unique holiday villa only 22 km from the adriatic sea with private pool; very peaceful and with unique interior. Air conditioning. 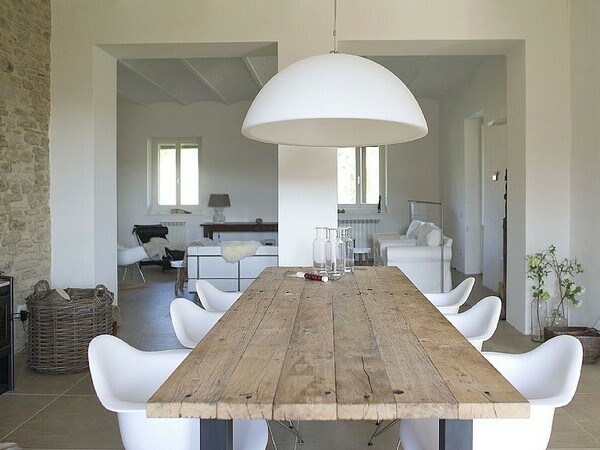 New restored, minimalistic styled country house in the Marches with private pool, only 23 km from the sea; more informations here. 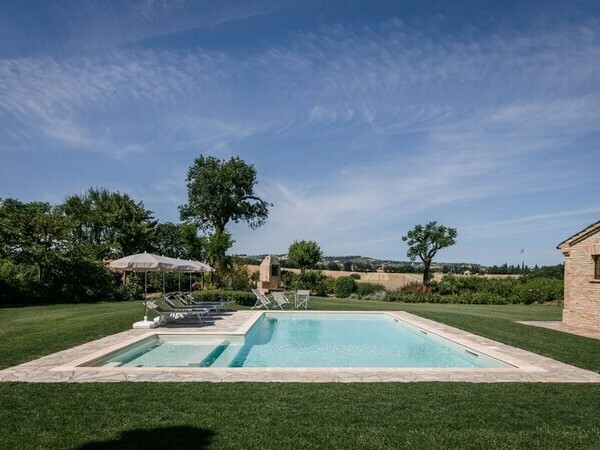 Exclusive design villa in the Marches in Italy with private pool, published in many decoration magazines. Luxurious and peaceful, superb views. 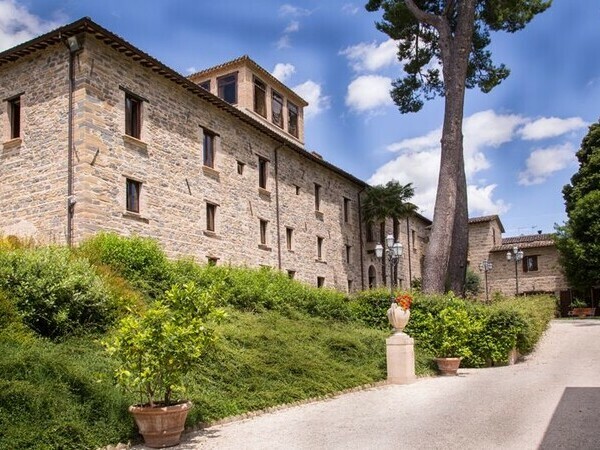 Castles in Le Marche, luxury and modern restored with indoor pool, near Acqualagna, the truffles town.